When most people in the USA hear the word “yoga,” they understand it to be an exercise. They envision a person on a mat striking poses and practicing stretches to develop the body and relax the mind. But there is more to it than meets the eye. These poses and stretches embody more than physical exercise. Yoga has power to unleash the Kundalini spirit. First of all, before we get to far I want to pray for you! Lord I ask that you reveal the Truth to every reader, and protect every reader from the evil that is being exposed in this blog, I ask that the Holy Spirit give each reader discernment, wisdom, and knowledge in the name of Jesus Christ. Amen. Exactly what is the definition of yoga? Yoga: Hindu discipline that promotes the unity of the individual with a supreme being through a system of postures and rituals. The word “yoga” means “to yoke.” Yoga is the act of yoking the practitioner to a Hindu god, Brahman who is said to enlighten the human soul by uniting with the human body. This “union” is accomplished through intense concentration, controlled breathing techniques, and prescribed yoga postures. To assist the yogi (teacher) in achieving this “Divine” enlightenment, a mediator between the practitioner and Brahman is invoked. The ancients describe this mediator as the Kundalini spirit. Kundalini means “serpent power.” When a person engages in yoga, the Kundalini spirit is spontaneously activated and spiritual enlightenment is imparted by Brahman. Unfortunately, most Christians do not understand that by its own definition yoga is an occult religious ritual. It is practiced through asanas (postures), mudras (occult hand signals), and mantras (chanted words) which are themselves ancient magical incantations. These incantations operate spontaneously on a vibratory and subliminal frequency. You may have heard a person chanting words like OM for example. Each practitioner upon his or her yoga mat unleashes sonic vibrations throughout a network of energy centers within the body called Chakras. The chakras consist of seven main energy centers found in the body and is associated with a variety of colors, symbols, and Hindu gods. In Hinduism, the continuous flow of energy throughout the chakras is referred to as “Shakti”. The concept of chakras was first mentioned in the ancient sacred Hindu text, The Vedas, but also plays an important role in Tibetan Buddhism. The Hindu’s believe that the Chakras are located along the spine and influence different nerve systems, organs and glands with their energy. 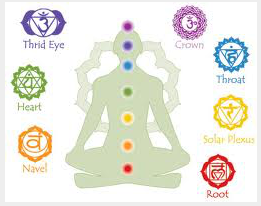 The energy that becomes coiled in the base of the spine (root chakra) is called Kundalini. The serpent Kundalini uncoils from the base all the way up the spine. The spiritual goal is to awaken this Kundalini in order to attain “enlightenment”. I will cover the chakras more at another teaching. Yogi masters, claim that Kundalini serpent power makes them “born again and baptizes them into new life”. Credit is given to the Kundalini serpent for connecting them to the all-pervading power of “Divine” love. Christians know that all-pervading Divine love comes from Jesus Christ and only from Jesus Christ. So who is this Kundalini spirit who claims Christ’s power? The Kundalini serpent is a spirit of anti-Christ, not the Lord Jesus Christ. Through the anti-Christ spirit of the serpent Kundalini, Satan positions himself as mediator between heaven and earth. In this position, he fulfills his desire to be worshiped as God. Satan is always attempting to usurp the position of Jesus Christ. Christ is indeed the only mediator between heaven and earth: I Timothy 2:5-6 For there is one God and one Mediator between God and men, the Man Christ Jesus, who gave Himself a ransom for all. Hebrews 9:15 And for this reason He is the Mediator of the new covenant, by means of death, for the redemption of the transgressions under the first covenant, that those who are called may receive the promise of the eternal inheritance. Throughout Scripture we are told to be aware of those “religious” persons, called false prophets, who come as “wolves in sheep’s clothing” claiming to be Christ Matthew 7:15. Lucifer, that serpent of old, the original wolf in sheep’s clothing, is the one who initiated yoga. His powerful scheme is to counterfeit the Christian’s worship of God. He accomplishes his goal through yoga, which incorporates a worshipful practice of sign language gestures, prayer positions, and bowing, all performed in a religious and reverent manner. There are many Christians that believe they can do “Christian Yoga”. By changing the words or mantras and meditating on God, they claim that it can be used as a way to pray or worship Jesus. This is such a lie. As a Christian we are supposed to meditate on the Word of God day and night, Joshua 1:8, and Psalm 1:2. Not meditate while doing Eastern Mysticism! In Hinduism there is over 330 million gods! Each pose represents a Hindu deity. The devotional bows (yoga poses) deceive many into believing they are worshiping Christ through yoga, but they are instead worshiping these idols. The Hindu’s highest goal is to become aware of one’s own divinity, or god consciousness. Some believe that yoga is just physical exercise, which is another deception. Hindu’s are offended at this western approach to yoga. They believe that the physical aspect of yoga cannot possibly be separated from the spiritual aspect, and likewise the spiritual cannot be separated from the physical. Hindu’s do not use yoga for the physical aspect at all! There is no Hinduism without Yoga. In the book of Corinthians, Paul explains that behind acts of idol worship lurks a receptive demon: 1 Corinthians 10:19 What am I saying then? That an idol is anything, or what is offered to idols is anything? 20 Rather, that the things which the Gentiles sacrifice they sacrifice to demons and not to God, and I do not want you to have fellowship with demons. When someone practices yoga they open the door to demons lurking in and behind these ceremonies. Demons receive the practitioners’ sacrifice of worship and consume them for their own egocentric appetites. They accept the offering of worship as if the purpose is to honor them through yoga. Therefore, the yoga practitioner has become a living sacrifice offered to demons rather than to God. As Christians, despite our hearts’ and minds’ desires to worship only God through Jesus Christ, we are in danger of committing idolatry. We cannot sacrifice ourselves to idols with body language that invokes the Kundalini spirit at the same time that we offer ourselves to God as a holy, set a part, and dedicated sacrifice to Him. I Corinthians 10:21 You cannot drink the cup of the Lord and the cup of demons; you cannot partake of the Lord ’s Table and of the table of demons. Colossians 2:8 Beware lest anyone cheat you through philosophy and empty deceit, according to the traditions of men, according to the basic principles of the world, and not according to Christ. In my studies of Yoga I found something even more sinister with the Kundalini spirit that is happening in our churches. The Kundalini spirit is being passed around from person to person by the laying on of hands supposedly as an impartation of the Holy Spirit. This also has a base in the Hindu religion. The meetings which Hindu gurus hold are called ‘Darshan’. At these meetings devotees go forward to receive spiritual experience from a touch by the open palm of the hand, often to the forehead, by the guru in what is known as the Shakti Pat or divine touch. After a period when the devotee has reached a certain spiritual elevation they begin to shake, jerk, or hop or squirm uncontrollably, sometimes breaking into uncontrolled animal noises or laughter as they reach an ecstatic high. These manifestations are called ‘Kriyas’. Devotees sometimes roar like lions and show all kinds of physical signs during this period. Often devotees move on to higher states of enlightenment and appear to slip into an unconsciousness. These actions are not controllable by the person who is manifesting them. These Kundalini manifestations are being passed around in Pentecostal and Charismatic churches in the guise of the Holy Spirit. Some people are having spiritual encounters, out of body experiences with demons and having dreams and visions that the demons make themselves look like Jesus or an Angel. These demons are deceiving people into believing they are having prophetic encounters with Jesus. People are acting drunk, manifesting kriyas, false healings, having “holy laughter”, flopping around like animals, and shaking uncontrollably. They are basically manifesting demons. This is nothing of the Holy Spirit. I will now show you a documentary video by Andrew Strom called, Kundalini Warning. It will go into more detail of how this has crept into the church and how it is spreading. Andrew Strom mentioned many preachers, prophets and ministries in his video. We do not know if these people are still practicing this false “anointing”. They may have repented, but the main lesson is that we need to test the Spirits and pray for our church leaders. We need to test EVERY preacher, prophet, and ministry. 1 John 4:1-3 We need to use discernment, and if we aren’t sure we simply need to ask for wisdom and God will give it. We need to be like the Bareans Acts 17:11 These were more fair-minded than those in Thessalonica, in that they received the word with all readiness, and searched the Scriptures daily to find out whether these things were so. We are specifically warned in the Bible that the Last Days will be a time of “seducing spirits,” false prophets, ‘lying signs and wonders,’ and that we always need to watch for “angels of light” masquerading as the real thing. Matthew 24:24For false christs and false prophets will rise and show great signs and wonders to deceive, if possible, even the elect. 1 Timothy 4:1 Now the Spirit expressly says that in latter times some will depart from the faith, giving heed to deceiving spirits and doctrines of demons, 2 speaking lies in hypocrisy, having their own conscience seared with a hot iron. 2 Corinthians 11:13For such are false apostles, deceitful workers, transforming themselves into apostles of Christ. 14 And no wonder! For Satan himself transforms himself into an angel of light. Why does the modern church not take these warnings seriously? We are living in the very days that the Bible warns about! I just want to clarify for those who are reading, as a Christian I am for the Holy Spirit and His gifts. I am for speaking in tongues, dreams, visions, prophecy, and healings, etc. I believe that this is absolutely Biblical, but the Kundalini spirit is not of the Bible nor is it of the Holy Spirit. The fruit of the Holy Spirit is love, joy, peace, forbearance, kindness, goodness, faithfulness, gentleness and self-control. Galatians 5:22-23 What we have just seen and learned does not bear witness to the Holy Spirit at all. The Holy Spirit is a gentleman, He would never have you flopping around on the ground, screaming uncontrollably! I also want to clarify for those who are reading, I do not believe in these Hindu teachings. I don’t believe that everyone has the Kundalini spirit inside them, but I believe if you do continue to practice yoga, you could potentially open yourself up to demons, and open yourself up to the kundalini spirit. Satan is very deceiving and has a counterfeit for everything that God has created for good. Just as the serpent (Satan) deceived Eve in the Garden, Genesis 3, so are many many people deceived about yoga. I don’t find it a coincidence that the Kundalini spirit is a serpent spirit! Yoga is being taught in schools for gym class, classes are taught at the YMCA, Doctors are recommending it, Physical Therapists are teaching yoga poses as stretches, yoga paraphernalia can be purchased anywhere, even companies are offering yoga to their employees as part of their health and wellness programs, and yes churches are holding classes for their members and also holding classes for the public as an outreach to the community. It is everywhere! So next time you hear someone talking about yoga, go ahead, tell them what you have learned! Spread the truth! This entry was posted in Occult and tagged Andrew Strom, Angels, Bible, buddhism, Christian Yoga, Christianity, Church, demonic, demonic manifestations, Demons, doctrine of demons, Eastern Mysticism, false apostles, false preachers, false prophets, false teachers, hinduism, Holy Spirit, Idolotry, Jesus, Kriyas, Kundalini, Satan, satan worship, Shakti Pat, Yoga. Bookmark the permalink. Reblogged this on praying watchmen. Thank you with all my heart for writing this post! Thank you. Please say a pray for me….that I too can share my experience with others as you have. This is not a game, I promise you.